Onechanbara’s story, which is like a psychotropic walk through a B-movie horror film at the best of times, certainly isn’t anything that’s going to be held up as “one of the greats.” The basic gist is that two sisters are battling the citizenry of Tokyo, who have unfortunately been infected by something known as “Baneful Blood.” Through some not at all clear miraculous happenstance, the sisters themselves are infected with this same blood and, naturally, instead of being turned into flesh-hungry zombies themselves, they become the perfect zombie killing machines. The remainder of the plot goes through a series of plot progression points that likely only make sense if you had the steel fortitude to play through the previous games in the series. To be fair, though, a great story isn’t exactly a requirement for a game to be fun. After all, Left 4 Dead just sets up the idea that the world’s been overrun with zombies and Francis, Zoey, Louis, and Bill are four survivors that are trying make it alive before getting to the actual zombie killing. 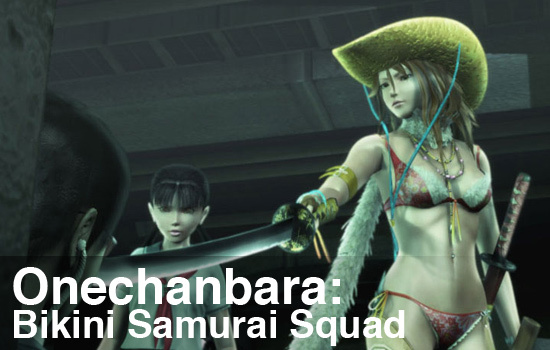 So despite the awful story, Onechanbara still had the opportunity to redeem itself by providing fun game play. Yet even in these respects the game seems almost determined to disappoint. The game mechanics center around mindlessly pressing the attack button to hack and slash the zombies into chunks of their former selves, which is, all things considered, pretty fun. That is until you inexplicably go into some kind of rage that slowly drains your health until you beat the level or – and how you’re supposed to know this is beyond me as nothing is mentioned in a tutorial or the manual – you find a statue (hidden somewhere in the level) that fixes this problem. In other words, the game creates an artificial timer to complete the level, which can only be removed by going off track and finding a special item, and essentially punishes the player for doing the one thing that is absolutely clear in the game: killing zombies. All of this still holds true for the co-op aspect of Onechanbara, but at least having a partner means you can either beat the level faster or cover more ground when searching for the statue. Unfortunately, this is also about as good as the co-op play gets. Page created in 0.4843 seconds.